Freeze-drying is often an easy and convenient way to obtain dry products of viable bacterial cells. An issue of the process is cell survival. We detail here a procedure to investigate how cell survival during freeze-drying is influenced by the properties of the formulation used. Wessman, P., Håkansson, S., Leifer, K., Rubino, S. Formulations for Freeze-drying of Bacteria and Their Influence on Cell Survival. J. Vis. Exp. (78), e4058, doi:10.3791/4058 (2013). Cellular water can be removed to reversibly inactivate microorganisms to facilitate storage. One such method of removal is freeze-drying, which is considered a gentle dehydration method. To facilitate cell survival during drying, the cells are often formulated beforehand. The formulation forms a matrix that embeds the cells and protects them from various harmful stresses imposed on the cells during freezing and drying. We present here a general method to evaluate the survival rate of cells after freeze-drying and we illustrate it by comparing the results obtained with four different formulations: the disaccharide sucrose, the sucrose derived polymer Ficoll PM400, and the respective polysaccharides hydroxyethyl cellulose (HEC) and hydroxypropyl methyl cellulose (HPMC), on two strains of bacteria, P. putida KT2440 and A. chlorophenolicus A6. In this work we illustrate how to prepare formulations for freeze-drying and how to investigate the mechanisms of cell survival after rehydration by characterizing the formulation using of differential scanning calorimetry (DSC), surface tension measurements, X-ray analysis, and electron microscopy and relating those data to survival rates. The polymers were chosen to get a monomeric structure of the respective polysaccharide resembling sucrose to a varying degrees. Using this method setup we showed that polymers can support cell survival as effectively as disaccharides if certain physical properties of the formulation are controlled1. Prepare a starter culture of Pseudomonas putida by inoculating 100 ml of tryptic soy broth (TSB) with a colony of P. putida cells cultured on agar supplemented with tryptic soy broth (TSA). Keep the culture at 30 °C on a shaking board set at 130 rpm. After 7 hr transfer an aliquot from the starter culture equivalent to 1/10 of the final volume of the main culture to fresh TSB-medium. Keep the cells at 30 °C on a shaking board at 130 rpm for 16 hr. After 16 hr of growth the cells are harvested by spinning the cell culture at 1,500 x g for 20 min at RT. Decant the supernatant and wash the cells by re-suspending the cell pellet is in a NaCl-solution that is isotonic to the growth medium. In this case a 150 mM NaCl solution was used. The cells are then centrifuged once more and the supernatant is decanted before resuspending the cells in the formulation medium, see step 3.2. To adapt the protocol to other bacterial species the cultivation and harvest procedures should be changed according to the requirements of that species. To avoid osmotic shock when handling the cells during harvest and the washing step(s), the osmolality of the solutions needs to match that of the growth medium at harvest. Prepare the formulation solutions by weighing out the respective matrix components and dissolve them in water. To achieve isotonic conditions, either adjust the amount of excipient or add NaCl or some other cell compatible solute to reach the desired osmolality. For substances with low molecular weight such as disaccharides the amounts can easily be adjusted to reach isotonic conditions. For substances like polymers that are of high molecular weight, the tonicity has to be adjusted with cell compatible solutes, e.g. NaCl or disaccharides. Note that any addition of a substance will influence the physical properties of the formulation, which in turn may influence freeze-drying behavior and cell survival. Decant the washing solution (in this case NaCl) and re-suspend the cells in the respective formulation media. Make sure that the cells are homogeneously dispersed. Formulations of low viscosity are vortexed whereas formulations of higher viscosities are mixed using by adding, e.g., a stir bar and shaking the container until homogeneous mixing is achieved. Divide the formulations into freeze-dryer vials. The vials should be weighed empty, with sample before and after freeze-drying to calculate the amount of water removed during freeze-drying. Add rubber stoppers to the vials if the vials are to be sealed inside the freeze-dryer, see step 4.3. Enumerate the cells in each formulation before freeze-drying, see step 6. The freeze-drying conditions have to be adjusted to the physical properties of the formulation. The most important parameter is in this case the glass transition temperature, Tg, of the formulation, denoted Tg' for the freeze-concentrated sample to indicate that water is still present. The Tg' of the freeze-concentrated formulation is easily measured using differential scanning calorimetry (DSC), see step 7. Adjust the parameters of the freeze-drying process so that the temperature of the sample is always below the Tg of the sample and that the chamber pressure allows for a fast sublimation of ice, i.e. primary drying, and residual water in the formulation, i.e. secondary drying. If the sample temperature is above Tg' during the drying process there is a great risk of structural collapse of the sample which may significantly decrease the cellular survival. To protect the dry products after freeze-drying the sample atmosphere has to be controlled. If possible, seal the samples in the freeze-dryer before the vacuum is released at the end of the freeze-drying cycle. Alternatively the vials can be filled with a preferred atmosphere. It is important to avoid exposing the samples to the ambient conditions as any moisture or oxygen present in the storage atmosphere will influence the survival of the cells. Rehydrate the samples with deionized and sterile water. The amount of water to be added should be that same as the amount removed during freeze-drying and is calculated from the weight of the empty vial, the same vial with sample before and after freeze-drying. Vortex the samples now and again then until the solutions appear homogenous. Draw 100 μl from each sample and make 10-fold serial dilutions. From the dilutions of interest 100 μl is plated on TSA-plates. The plates are incubated at the temperature and time required. Take a small amount, 5 - 10 mg, of the sample and enclose it in a DSC-aluminium pan with lid. Prepare an empty pan as a reference. Set the DSC temperature scan program. The cooling program is set to mimic the freezing step in the freeze-drying program. This is done as the cooling kinetics can influence the Tg' of the hydrated formulations. Before the heating scan begins bring down the temperature to well below the expected Tg' of the investigated formulations, normally -100 °C. Choose an appropriate heating rate, normally a heating rate of 5 - 40 °C/min is used. The recorded heat flow signal is expressed in watts and will be influenced by the heating rate. A higher heating rate will give a larger signal of Tg'. Set the temperature range so that it covers both Tg' and the melting of the formulation. The experimental setup used in this experiment is according to the du Noüy method to measure surface. Clean the platinum ring and the measuring vessel carefully. The vessel is rinsed with acetone, wiped with a lint-free tissue, and then burned on the inside with a colorless flame. The ring glows red in a colorless flame. Fill the vessel with the solution and let the surface settle before measuring. For solutions where the equilibrium state is reached only after a long time, e.g. polymers, the simple setup used here will provide qualitative data. For formulations with high viscosities, e.g. solutions of 2% (w/w) HEC or HPMC, the surface tension has to be measured on solutions of lower concentrations and then extrapolated. This can be done by taking advantage of the fact that the drop in surface tension levels off at concentrations below 0.5% (w/w). Take a small amount of matrix/bacteria and load it onto a sample holder. Mount the sample holder into the X-ray-diffractometer. To analyze any crystalline phase present in the sample the EVA program package from Bruker can be used. Take a small amount of matrix/bacteria out of the vials and fix it on a SEM stub. Load the SEM holder in the sputter-coater (Thermo VGScientific Polaron SC7640 used in the present work) and coat the sample with a few nm of Au/Pd or Pt. In these experiments the sputtering parameters were: 1,900 V, 20 mA, and 20 sec, for a ~ 5 - 10 nm Au/Pd coating. The coating reduces electric charging during image acquisition. It is recommended to start with a thin coating and, if charging persists and causes image artifacts, the sample should be coated again. Load the SEM holder in the SEM chamber. Select appropriate imaging parameters. For the instrument used in Figure 2 (FEI Strata DB235) we used 5 kV accelerating voltage, spotsize 3, a working distance of 5 mm and the secondary electron detector. Optionally, it is possible to use the Focused Ion Beam to cut cross-sections of the bacteria embedded in the polymer to reveal further details. Table 1 displays data on formulation composition, thermal events recorded by DSC during heating of the frozen formulations, structure of the dry samples and the surface tension of the formulation solutions. The Tg' of sucrose has been determined to -40 °C 2, 3and can be difficult to detect for sucrose concentrations below 20% w/w. The thermal event at -35 °C is probably related to the onset of ice dissolution2. The crystalline structure detected by X-ray in the HEC and HPMC samples and also seen in SEM (see Figure 2b and 2c) overlap with the normal crystal form of NaCl. Figure 1A shows survival data for the Gram-negative P. putida and the Gram-positive A. chlorophenolicus formulated in the different saccharide based formulations. Note that the trend in how well the formulations support cell survival is the same for both bacteria species. The plot shown in Figure 1B illustrates the correlation between the freeze-drying survival and the surface tensions of the formulations. 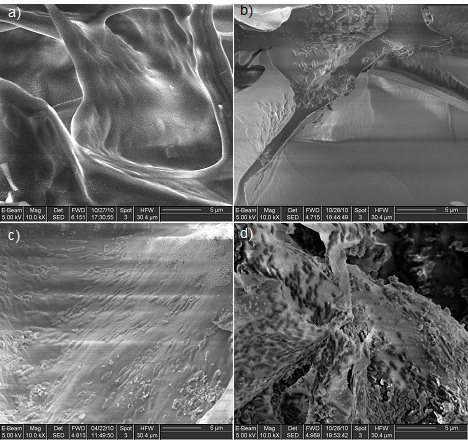 Figure 2 shows SEM-images of the dry formulations. For the four polymers shown here, the matrix formed has the appearance of "crisp paper": interconnected smooth sheets in which the bacteria are embedded and show up as corrugations. For Ficoll and Sucrose, the sheets are about 1 μm thick and 10 - 20 μm wide, with Ficoll having a smoother surface. HPMC and HEC form much thinner sheets, possibly due to the fact that the amount of polymer is less in these cellulose-based formulations than in the others (Table 1). Moreover, salt crystals were observed for HEC and HPMC, with the latter showing a larger amount of precipitates on the surface of the polymer sheets. Bacteria are more easily seen in the cellulose based formulations because the sheets are thinner. In Sucrose and Ficoll, they are mostly observed as corrugation of the otherwise smooth surfaces. Table 1. The composition of the different formulations and properties of the aqueous or dry formulations. The polymer concentrations of the HEC and HPMC were maximized to achieve a thick enough matrix cover of the bacteria but still have a workable solution as regards to viscosity. Figure 1. A) Survival rates of freeze dried P. putida (white) and A. chlorophenolicus (grey) when formulated in solutions based on the disaccharide sucrose or the polymers Ficoll, HEC and HPMC, B) Correlation between cell survival after freeze drying and the surface tension of the un-dried formulations. Figure 2. SEM images of P. putida in four different formulations: a) sucrose, b) Ficoll, c) HEC, d) HPMC. The bacteria are difficult to see in a) and b) because the polymer sheet are quite thick and can envelop the bacteria completely; in c) and d) the bacteria show up more prominently on the surface. In d), they can be distinguished from the large amount of salt precipitates because of their shape and contrast, as they appear as oblong, dark corpuscles. The motive for this study was to investigate some formulation properties that may be of importance for cell survival during freeze-drying. Although the intrinsic drying tolerance varies between different species, as illustrated in Figure 1A, the trend on how well the different formulations support cell survival is similar. It is informative to start with a comparison of sucrose and Ficoll. It is believed that a key factor for a formulation to support cell survival is the capability of the formulation ingredient(s) to replace water during dehydration, thus maintaining the structure of the proteins and membranes of the cell also in the dry state. Disaccharides such as sucrose but also trehalose show this property, whereas polymers such as the polysaccharide starch do not5,11. Polymers are considered too large to interact with the membrane lipids in the same fashion as disaccharides. Another property important for a successful freeze-drying of microorganisms is the ability of the supporting matrix to vitrify (i.e. become amorphous solids) during freeze-drying. The amorphous structure is beneficial for shielding and keeping cells separated. Interestingly, both disaccharides and polymers readily vitrify if the freeze-drying is properly performed. Our results show that both the sucrose and Ficoll based formulations become amorphous after freeze-drying, see Table 1, and support cell survival equally well. However, there are significant differences between the two saccharides. In contrast to sucrose, the Ficoll molecule is, with a molecular weight of 400 kDa, too large to replace water in the interactions with lipid membranes during freeze-drying 4, 5. Furthermore, as the Ficoll molecules are barred from the periplasmic space of Gram negative bacteria, again owing to their size6, cellular uptake of Ficoll is unlikely. Based on this, we suggest that the protective effect provided by the sucrose formulation is not primarily due to cellular uptake of the disaccharide, important for water replacing capacity of intracellular structures 7, 8. Rather, the capability of Ficoll to support cell survival has to do with properties common to both the Ficoll and sucrose formulation, e.g. the amorphous structure. Focusing on the polymers, it is evident from Figure 1A that the capability of the polymer formulations to support cell survival varies. The X-ray analysis showed that NaCl crystallized during freeze-drying and coexisted with the otherwise amorphous structure of the HEC and HPMC formulations. No crystalline material was detected in the Ficoll based formulation. NaCl can form complexes with the hydroxyl moieties in carbohydrates 9, 10. In Ficoll and HEC-based formulations the NaCl to hydroxyl moiety molar ratio was 1:11 and 1:1, respectively, explaining why no crystallization was detected in the Ficoll-based formulation. The phase separation between NaCl and the cellulose polymers was also observed in the DSC-investigations. A eutectic melting was recorded during heating of the frozen HEC and HPMC-formulations indicating that the phase separation takes place in the frozen state. The morphology and microstructure of the formulation is revealed by SEM imaging (Figure 2) and corroborates the DSC and X-ray data. Bacterial cells are seen protruding from the sheets with deposited NaCl crystals clearly visible on the surface of the HEC-sheets. Based on the similarity between the survival rates for bacteria formulated in the HEC-solution and Ficoll solutions as compared to HPMC we conclude that the state of the salt, whether dispersed as crystals or dissolved in the polymer, does not correlate with cell survival. Instead cell survival shows a relationship with the surface tension of the formulations, see Figure 1B. For lower surface tensions, lower survival rates are recorded for the bacteria. Note however that the measured surface tension displays the interaction between the solutes, i.e. sucrose and the polymers, and the solvent molecule. Still it allows for an indirect speculation that surface activity of polymers can be related to their tendency to interact also with the cell surfaces in a destabilizing manner. As the concentration of the solutes increases during freezing, the negative effects may be potentiated explaining why the negative effect of the surface active polymers were not seen when only storing the bacteria in the fully hydrating formulations. No conflicts of interest declared. The work was supported by The Swedish Foundation for Strategic Environmental Research (MISTRA) through the DOM program and Grant 211684 (BACSIN) from the European Union Community FP7 Framework program. We thank J. Engstrand for assistance in filming the X-ray analysis and L. Tang for helping with the conceptual narrative. Lyostar II FTS Kinetics N.A. Pyris Diamond DSC Perkin-Elmer N.A. Krüss Educational Tensiometer Krüss N.A. Wessman, P., Mahlin, D., et al. Impact of matrix properties on the survival of freeze-dried bacteria. J. Sci. Food Agric. 91, (14), 2518-2528 (2011). Ablett, S., Izzard, M. J., et al. Differential Scanning Calorimetric Study of Frozen Sucrose and Glycerol Solutions. Journal of the Chemical Society-Faraday Transactions. 88, (6), 789-794 (1992). Knopp, S. A., Chongprasert, S., et al. The relationship between type TMDSC curve of frozen sucrose solutions and collapse during freeze-drying. Journal of Thermal Analysis and Calorimetry. 54, (2), 659-672 (1998). Crowe, J. H., Leslie, S. B., et al. Is Vitrification Sufficient to Preserve Liposomes during Freeze-Drying. Cryobiology. 31, (4), 355-366 (1994). Jain, P., Sen, S., et al. Effect of glass-forming biopreservatives on head group rotational dynamics in freeze-dried phospholipid bilayers: A P-31 NMR study. Journal of Chemical Physics. 131, (2), (2009). Stock, J. B., Rauch, B., et al. Periplasmic Space in Salmonella-Typhimurium and Escherichia-Coli. Journal of Biological Chemistry. 252, (21), 7850-7861 (1977). Crowe, J. H., Hoekstra, F. A., et al. Anhydrobiosis. Annual Review of Physiology. 54, 579-599 (1992). Leslie, S. B., Israeli, E., et al. Trehalose and Sucrose Protect Both Membranes and Proteins in Intact Bacteria during Drying. Applied and Environmental Microbiology. 61, (10), 3592-3597 (1995). Nesarikar, V. V., Nassar, M. N. Effect of cations and anions on glass transition temperatures in excipient solutions. Pharmaceutical Development and Technology. 12, (3), 259-264 (2007). You, Y., Ludescher, R. D. The effect of sodium chloride on molecular mobility in amorphous sucrose detected by phosphorescence from the triplet probe erythrosin B. Carbohydr. Res. 343, (2), 350-363 (2008). Crowe, J. H., Hoekstra, F. A., Nguyen, K. H. N., Crowe, L. M. Is vitrification involved in depression of the phase transition temperature in dry phospholipids. Biochim. Biophys. Acta Biomembr. 1280, 187-196 (1996).